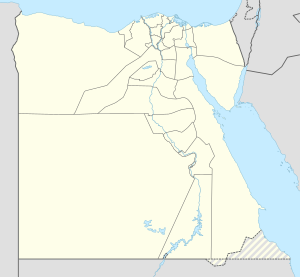 Girga (Egyptian Arabic: جرجا‎ pronounced [ˈɡeɾɡæ], Coptic: ⲧⲓⲛ Din) is a city in the Sohag Governorate of Upper Egypt. It is located on the west bank of the Nile River. Girga was the capital of the Girga Governorate until 1960, when the capital was moved to Sohag and the name of the governorate changed accordingly. Girga has an estimated population of 71,564 (as of 1986) and has various economic industries which include cane sugar manufacturing and pottery. As of today, it is unconfirmed to whether this is the site of the ancient city of This (Thinis) or the nearby village of Birba which was the capital of Egypt during the 1st and 2nd dynasties. The name "Girga" is said to have derived from the ancient Mar Girgis Coptic Monastery and was built in dedication to St. George. Also another monastery, the el-Sini is reportedly the oldest Roman Catholic monastery ever built. Girga has also been famed for its landscape, the beautiful paved Suq, and the el-Sini (Porcelain Mosque), which is reportedly the oldest known Roman Catholic monastery and was almost swept away by the Nile at one time. Also neighbouring Girga is the ancient sites including Beit Khallaf, a necropolis where tourists can find mudbrick tombs dating back to the 3rd dynasty. The city was home and headquarters of the first Pharaoh of a unified Egypt, Narmer. The city has been known as Dgerja or Gerga. At one time, it was the center of Ottoman rule in the South Egypt, one of the largest cities of the Ottoman Empire. In 1791, Saint Yousab El Abah (also Joseph el-Abbah) was the bishop of the city. ^ Law, Gwillim (1999). Administrative Subdivisions of Countries: A Comprehensive World Reference, 1900 through 1998 (snippet view). Jefferson, NC: McFarland. p. 114. ISBN 978-0-7864-0729-3. Retrieved 2010-08-07. ^ "Climate: Girga - Climate graph, Temperature graph, Climate table". Climate-Data.org. Retrieved 14 August 2013. Wikimedia Commons has media related to Girga. This page was last edited on 17 January 2019, at 18:21 (UTC).